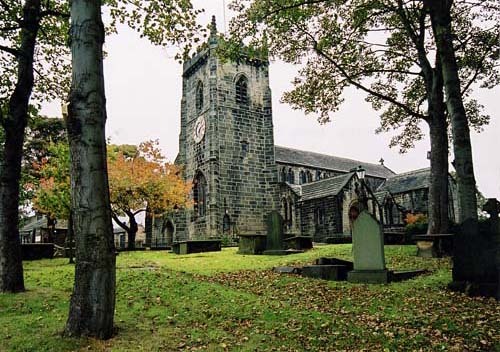 199 years and one day ago, the 19th of August 1818, witnessed a special event at St. James’ Church, Thornton: the baptism of the parish priest’s fourth daughter, Emily Jane Brontë. Presiding over the ceremony was a man who was a great friend of Emily’s father, the Reverend William Morgan. Morgan would be present at many Brontë family events, some happy and some not so happy, and to Charlotte Brontë he would be known as Uncle Morgan to his face and the ‘Welsh windbag’ behind his back. The beautiful Christening cup created for this auspicious event of 1818 can still be seen in the Brontë Parsonage Museum today, and you can also buy a replica of it in the shop. 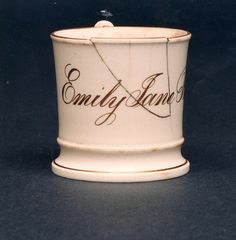 A year and a half after Emily’s christening he also presided over the christening of the final child in the family, Anne Brontë. This event took place in Thornton’s church on 25th March 1820, with Morgan presiding and Elizabeth Firth and Fanny Outhwaite acting as godmothers – a month later the family would leave Thornton behind and head to their new parish of Haworth. There would be no more christenings for Morgan to preside over in Haworth, but, alas, he was all too soon and all too frequently called upon to carry out the funeral services of the children he had christened. William Morgan was born in Wales in 1782 and entered the priesthood at the same time as Patrick Brontë. Their paths first crossed in 1809, when they were both assistant curates in the town of Wellington, Shropshire in the English Midlands. When Patrick later moved to Yorkshire to become assistant curate in Dewsbury he found there were already two of his friends from Shropshire in the vicinity. Morgan was already a curate in Bierley, near Bradford, and John Fennell, who they had both known from Wellington, was now running Woodhouse Grove School. This was an auspicious event, as Patrick, probably at Morgan’s suggestion was employed at the school as an examiner in the classics. Morgan already had an interest in the school as he was in love with John Fennell’s daughter Jane who worked there. Patrick himself soon fell in love with another member of the school’s staff – Jane’s cousin and John’s niece Maria Branwell who had recently arrived in Yorkshire from Cornwall. As you can imagine, this dual ceremony cemented bonds of friendship that lasted a lifetime. I mentioned a triple wedding, for the joining together of these two couples was also linked to another wedding taking place 400 miles away. On the same day, 29th December 1812, Maria’s younger sister Charlotte Branwell married her cousin Joseph Branwell in Penzance. Acting as witness to the marriage in Cornwall was the elder sister of Charlotte, Elizabeth Branwell, who would later play a huge role in the Brontë story. This triple wedding at two locations was no coincidence. Charlotte’s daughter, also called Charlotte Branwell, later recollected her mother telling her how the three women had corresponded with each other on the subject and arranged it so that the two ceremonies, and three weddings, coincided. William Morgan was a stout, in more ways than one, and reliable friend to Patrick, and it is likely that he was among the people who cleared Patrick’s debts after the death of his wife Maria, debts that had been incurred in a fruitless attempt to find a cure for the woman he loved. To the Brontë children however he became something of a figure of fun. This may have been because of his sing-song Welsh accent, or his increasingly rotund figure, but it was most likely because of his reputation for preaching sermons that went on, and on, and on. Morgan’s wife Jane, cousin of Maria Brontë of course, died in 1827, and in 1836 he married again to a woman called Mary Gibson. William himself died in 1858, and we should not let Charlotte’s opinion of him cloud ours. When Patrick needed a friend he was there, and he was present at some of the most vital moments of Brontë family life, the christenings and funerals. 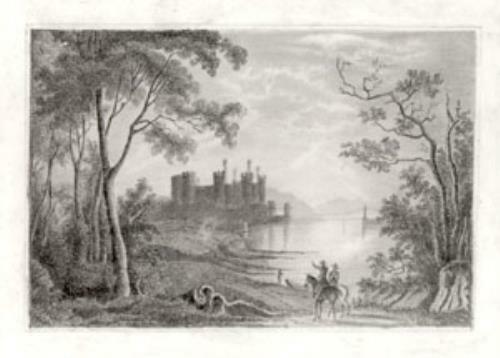 In 1854 Charlotte Brontë visited the homeland of William Morgan, as she travelled through Wales on her honeymoon en route to Ireland, the land of her new husband Arthur Bell Nicholls. She loved the country’s rugged landscapes and its magnificent castles, as we can see from this drawing that she made of Conwy Castle. Maybe at last her thoughts turned with some fondness to her Uncle Morgan? Charlotte Bronte formed unfairly at times negative opinions of people. There are many instances of Charlotte criticising people and others praising that person. She was not always a reliable point of reference, I would imagine Mr Morgan was a man who liked the sound of his own voice and I should imagine he would be boring company. But in his defence he was a good friend to Patrick and on many occasions he was there when Patrick needed assistance. William Morgan came to Hulcott, Buckinghamshire in November1851, to a living that he exchanged with the Rector, Rev. William Ramsden Smith. Margan’s second wife Mary Alice accompanied him but died in May 1852 and was buried at Hulcott. Rev. Morgan immediately set about raising funds to build a school in this small hamlet, a task he achieved by 1855. No mean task in a sequestered village of no more than 20 houses. In the interim he married Mary Howell of Bristol. He then raised money to build an adjoining house for the teacher . He started to suffer from ill health, and the journeys to London to meetings about his school plans became a trial for him. By 1858 Morgan’s health had suffered greatly from a very draughty and cold timber-framed rectory, and he and his wife Mary may have travelled to Bath for the good of his health, and it is presumed that he died there. His wife informed the National society of his death by letter in April 1858.